by The Mechanic's Wife | Sep 8, 2015 | Did You Know? Meet Joseph, a veteran auto technician (aka auto mechanic), highly experienced after 20 years in the industry. Surely, Joseph is rolling in the dough. Right? After all, he’s highly knowledgeable. His experience includes engines, transmissions, cooling systems, drivetrains, axles, suspension, steering, brakes, electrical, and heating and air conditioning. He deals on a regular basis with the physics of the moving parts, the chemistry of the various fluids a vehicle requires, and the various electronic systems. (I want to make a joke here about the teacher from Charlie Brown because that’s how much I know about these topics…but I’m also not that funny). So, while a mechanic like Joseph may have both depth and breadth of knowledge as well as formidable mechanical skills, he may also be tied to a pay system which constantly contradicts his mastery, and the only “dough” he’s rolling in will soon become the base of his pizza dinner. This, in part, is what makes talking about diagnostic and labor rates complicated and why I’m including the mechanic’s pay in this series, “Understanding Your Bill”, alongside posts on diagnostic and labor rates, and the deal on parts mark-up. Flat rate is a type of commission paid to mechanics. Instead of paying them per hours worked, their hours are added up according to the jobs they perform. Where your bill is concerned, flat rate compensation is usually worked into the labor rate. It’s important to note here that the labor rate you see listed on your bill is not Joseph’s hourly pay-rate. Joseph’s hourly pay is one small portion of the total labor rate which also helps cover the shop’s overhead expenses. What do I mean by small? In Central Florida, for example, labor rates can vary from $70-$120. Technicians will commonly be paid anywhere from $15-$25 per flat rate “hour.” Some of them may get paid more hours than they work. Many will not. On the surface, flat rate seems fairly simple. Once you dig a little deeper, you’ll find that it’s not. Here’s how I’ve come to understand it. You bring your car to Joseph because it’s making a funny noise. The shop will pay Joseph 1.0 hours diagnostic labor time but it takes him two hours to figure out what’s wrong (see my post on diagnostics). He tells you your Thingy-Ma-Jig is flatter-walling. The industry standard for replacing the Thingy-Ma-Jig is two hours (called “book time”). However, this is not a common problem, so Joseph doesn’t have a ton of experience doing this repair. Additionally, the Thingy-Ma-Jig in your type of vehicle happens to be underneath the Whatsit. So, because he wants to be sure to do the job right, Joseph takes some time to research the correct way to do it and is careful to not miss a step. Plus, he first has to take out the Whatsit so he can reach the Thingy-Ma-Jig, and then he has to put it back and make sure it is done correctly so as not to cause further problems for your car. When all is said and done, it takes Joseph three hours to do the job, but he’s only paid for two hours (called “flag hours”) because that’s an industry standard time to repair the Thingy-Ma-Jig. This is a common scenario. It seems good for you because you only pay for part of what Joseph put into it, but unfair to Joseph who is only getting paid for part of his time. On the flip side, say Joseph has seen and replaced many flatter-walling Thingy-Ma-Jigs. He knows what’s probably wrong and how to quickly confirm it. He gets paid for 1.0 hours of diagnostic but it only took him 0.5 hours to confirm the problem. Plus, in your car the Thingy-Ma-Jig is very accessible, making it a simpler fix. It only takes him 0.75 hours but he still gets paid for one hour of labor. This seems good for Joseph, but bad for you, the customer. 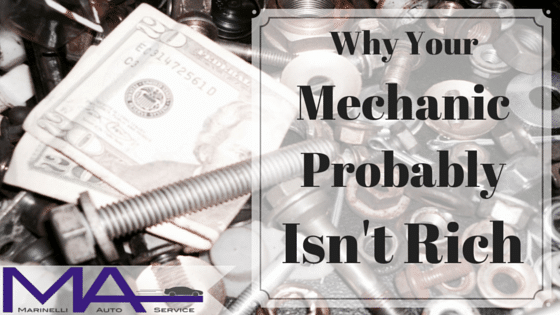 Why do businesses pay their mechanics flat rate? One idea behind flat-rate is that while some jobs may take a little more time, others take a little less time, so Joseph should be able to flag 40 hours each week. So, you win some, you lose some, but at the end of the week it should all even out. Reading professional auto technician forums and talking to my husband and his fellow mechanics, it seems this rarely happens. Usually the techs are scrambling to make up lost hours on previous jobs – especially jobs that are particularly involved, difficult, or complex. They find some of the book times to be inaccurate. Or, sometimes a manager requires the techs to spend time doing things they don’t get paid for. And the list goes on because the system doesn’t allow for adequate legal protection (and that’s another post for another day…). Some mechanics have figured out how to work around the system – cutting corners in ways that jeopardizes the quality and safety of the work on your vehicle – so they can bring home a decent paycheck. But that’s where honesty and integrity is lost in the industry and you, the customer, suffer. Aside from flat rate being the norm since the mid-20th century, most of the time, flat rate is used because it brings good probability that the business will meet its overhead costs and still make a profit. Meanwhile, the mechanic’s pay often suffers. The question is whether there is a better way for the business to both meet its overhead costs and compensate the mechanic fairly. What is the alternative to flat rate? It seems like hourly or salaried pay would be the ideal alternative to flat rate. Maybe they are. Some mechanics will be much more motivated to work in that environment. Many employers fear that hourly or salaried pay will remove any motivation of working hard. Some technicians and business owners believe that a hybrid system of commission mixed with base hourly pay is the best option. Other technicians thrive under the flat rate system and may not want to work under a different pay plan. Yet, other techs find an hourly position and hope to never go back to flat rate. Marinelli Auto Service believes that treating others well takes top priority. Techs with strong character will show that character through their work no matter how they are paid. No matter what pay system is used, employers should seek to compensate their employees fairly and adequately. While flat rate can work, the current reality is that it is commonly abused. To change the mindset of both business owners and mechanics after 70 years of using the flat rate system will take time. Some shops have already done away with flat rate. Others have figured out how to make it work well for both the business and the mechanic. In the mean time, Joseph relies on his experience and knowledge as he approaches each new vehicle that comes through the shop. He knows that some days he’ll be able to make a decent wage and others he’ll be trying hard to make up for lost flag hours. Such is the life of a highly skilled automotive technician. Now that you have a better idea of what is involved with diagnostics and labor rates and a mechanic’s pay, keep watch for the final post on parts mark-up.